The final week of preparation fell on Halloween week. The two big remaining items were 1) getting insurance that would cover our passage for the boat, and 2) the girls had to finish their costumes for Halloween. Although Frank started working with insurance agencies at the beginning of October, it took until the very day of our planned departure before they finally got the binded insurance policy confirmation faxed to us. Whew! Similarly, the girls finished their costumes at the last minute (Karen is a master seamstress, so with her help they were able to make it). 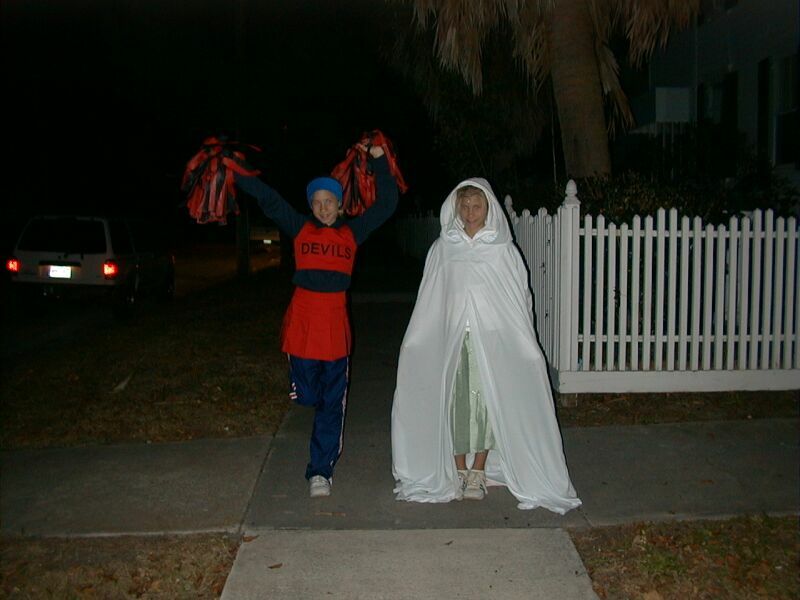 We took them down Front Street in Beaufort to the few open stores that night, and then around the surrounding neighborhood. One of the houses was quite drammatic with a "dead" body falling out of the tree as you walked by, and then a guy running out of the bushes with a chainless-chainsaw running at full blast! Shearwater II, the other Voyage catamaran who was also planning to leave Beaufort for Bermuda at the same time, showed up on November 1 late in the day. You can visit their web site at http://www.shearwater-sailing.com/. Shearwater pulled up along side PatiCat early on Saturday, November 2nd, and we took the dingy over to meet them. Then, shortly after, PatiCat went over to top off the fuel tanks. A few other final errands - including one last weather update from the Library's Internet computer - we were off by about 1:15 PM! Yay! 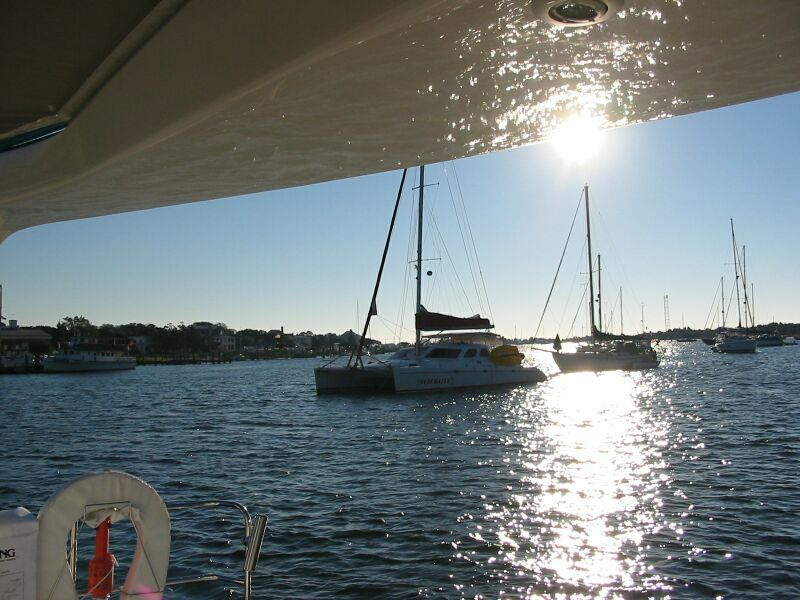 Just a few hundred yards out of Beaufort we put up sail and the two cats proudly motor-sailed their way out the Beaufort Inlet into calm seas with a light northwest wind. (Note: the second picture here was the next day as we were headed southeast). 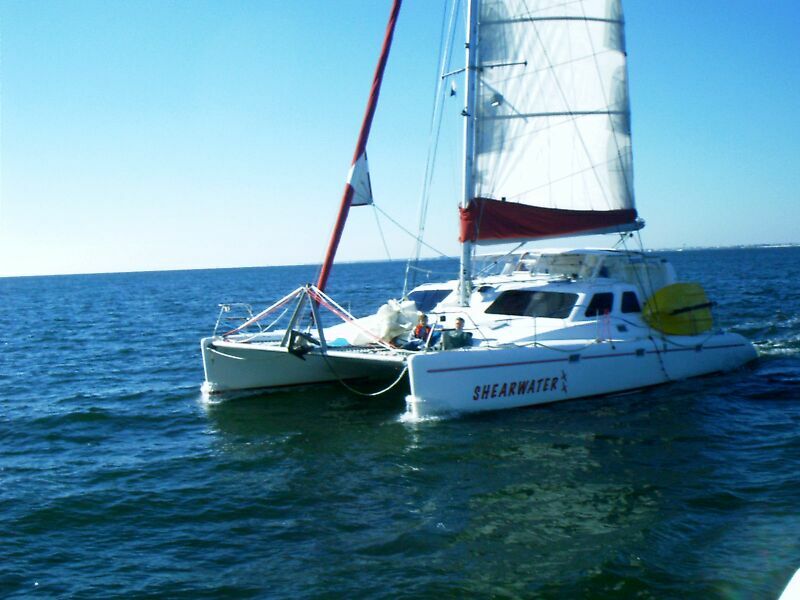 Once we rounded Cape Lookout we both put up the spinnakers and had a grand ride out towards the gulfstream in the evening. As we got to the gulf stream the winds started gusting up, and of course the notorious gulf stream responded with some choppy waters. This made continuing to fly the spinnakers tough, so Karen and Frank decided it was time to pull down ours. It turned out to be a much more difficult chore than anticipated. Frank had never attempted pulling such a large spinnaker down in high winds before. It turns out (this won't surprise most of you) that Frank doesn't weigh enough to pull down the chute in high winds! He was flying off the deck (while holding the chute rope) several times before he called in Karen for help. We eventually got it down most of the way, but the winds got even stronger and blew the remaining sail outwards. 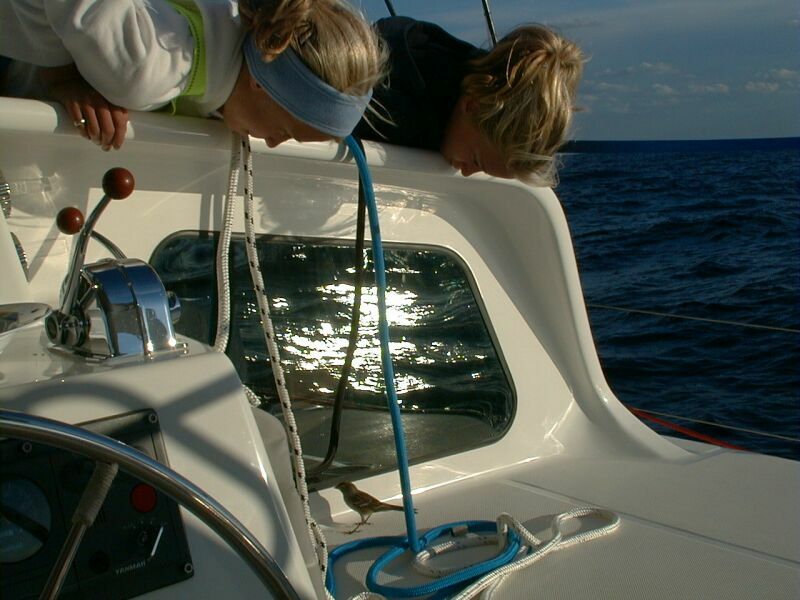 We attempted lowering the spinnaker halyard, but this turned out to be a bigger mistake. 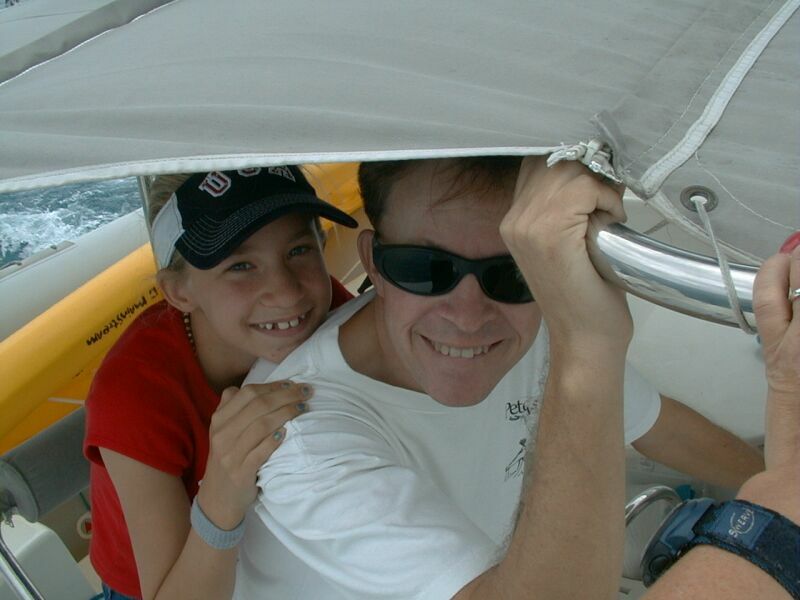 Before we knew it, the lower part of the sail went over the starboard bow and into the water. Those of you who are sailors know this is bad news. To make a long story short, we ended up with a ripped spinnaker by the time we got it pulled up. Not only that, but it knocked off our starboard navigation light. Sigh. After that little excitement, the rest of the trip went pretty smoothly. And, in a way, it helped increase our confidence because we learned how to better handle the situation in the future. Shearwater helped as well, by telling us on the radio about similar experiences they had when they first flew their spinnaker. Frank successfully retrieved weather faxes and weather reports over the long-range SSB radio. There was some concern about a rapidly developing weather system near Bermuda on Wednesday afternoon. Shearwater was not making good speed under motor - they have smaller engines than PatiCat, and a heavier load. And, we had light winds on the second day. After discussion with Shearwater, it was decided PatiCat should make speed to beat the forecasted bad weather if we could, and keep Shearwater informed by SSB and satellite phone if needed. 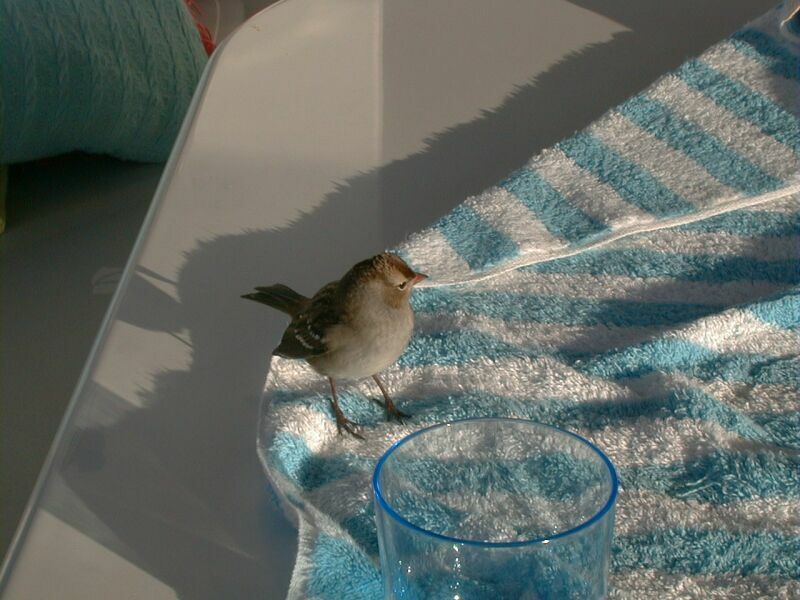 While we were going along, we had a visitor who joined us for about a day. 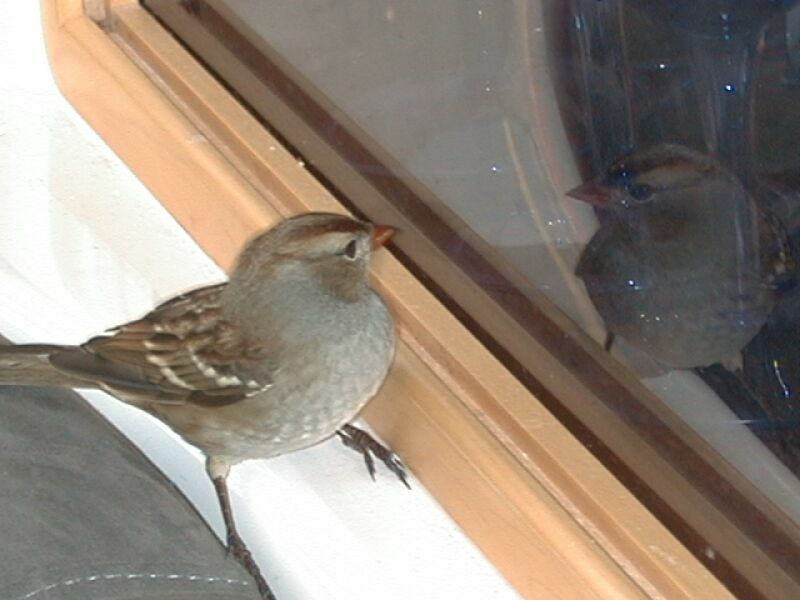 A little bird 300 miles from any shore decided, as tired as he was, that we were the next best thing to shore. It turned out he visited Shearwater as well. But, he stayed the night with us. Here are a few pictures both inside and outside the boat of the little guy. PatiCat motored ahead for a few hours and then picked up better winds and had a good couple of days of sailing into Bermuda. In fact, the last 6 or so hours on early Wednesday morning was quite thrilling and with sunny skies. 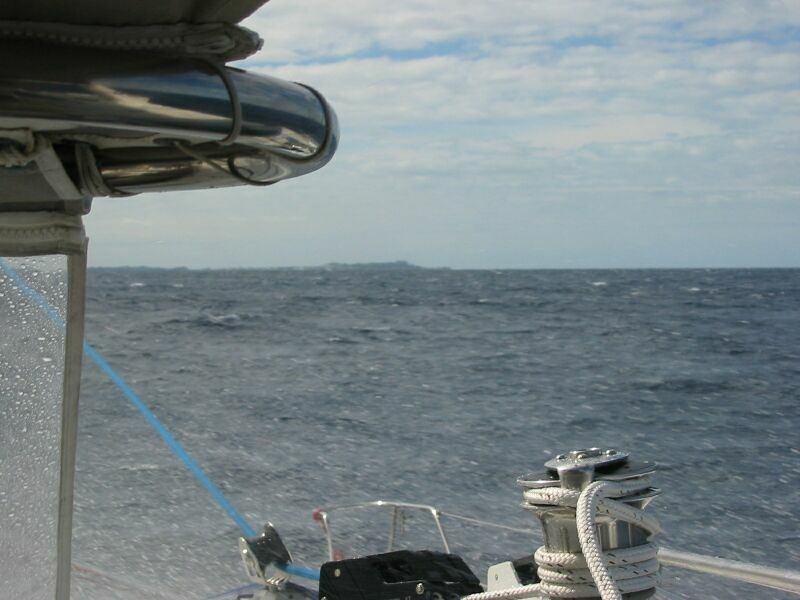 The winds picked up all morning and by the time we crossed the northern side of Bermuda the winds were 20-25 knots. When we made the turn to go south-southwest (into the wind) the waves were quite choppy, so we had to reduce speed to about 4 knots until we made the harbour. It was about 1.5 hours of a bumpy ride, but it wasn't too bad as long as you stayed behind the spray dodger. PatiCat made it into St. Georges harbour at 12:30PM on November 6, 2002 and got permission to anchor first before checking into customs. This was a good move as a number of boats came in so we were able to get a good anchorage on the west side which was most protected from the forecasted stronger west winds later that night. The four of us went over to customs a few minutes later and had a pleasant time clearing customs with their friendly staff. We then did a bit of scouting about the town. We quickly found the famous White Horse Tavern which is renowned by cruising sailors everywhere. It's just a nice bar and restaurant at the port entry there, but it still felt nostalgic to visit there. We found the visitor's center and picked up brochures and tips, and Karen didn't hesitate to visit the supermarket and buy a few needed provisions. Before we left, we also found a sailmaker who told us they could repair our spinnaker if we could wait until the end of the weekend. In addition, they had some Internet-connected computers which we used to let folks know we had made it. Shearwater was only about 6 hours behind PatiCat in their anticipated arrival. However, as mentioned, the winds were continuing to build. 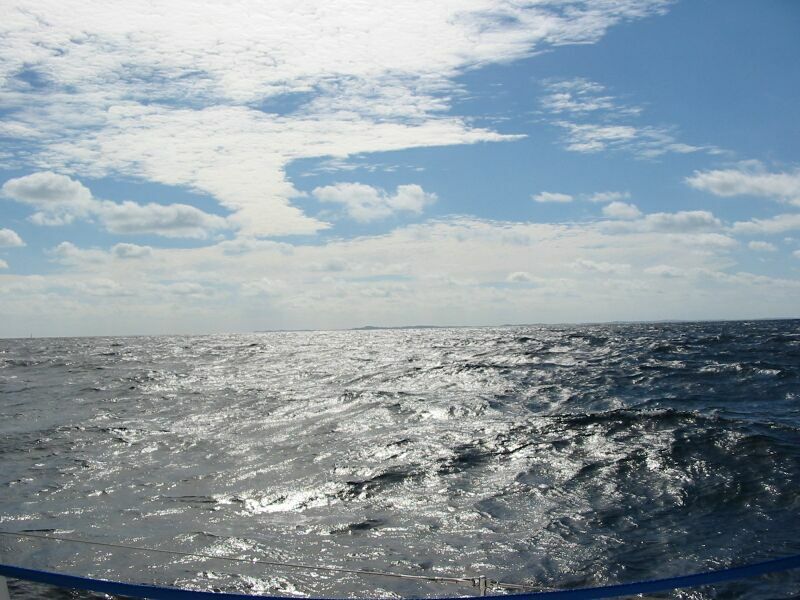 By the time they rounded the north side, they had near-gale winds with 30 knots+ in their face and much bigger seas. They unfortunately had a jackline fall in the water which promptly got wrapped around their propellor cutting them down to one engine. With the stronger winds and waves, they couldn't make headway by engine alone. So, they had to try and sail their way into the harbour! 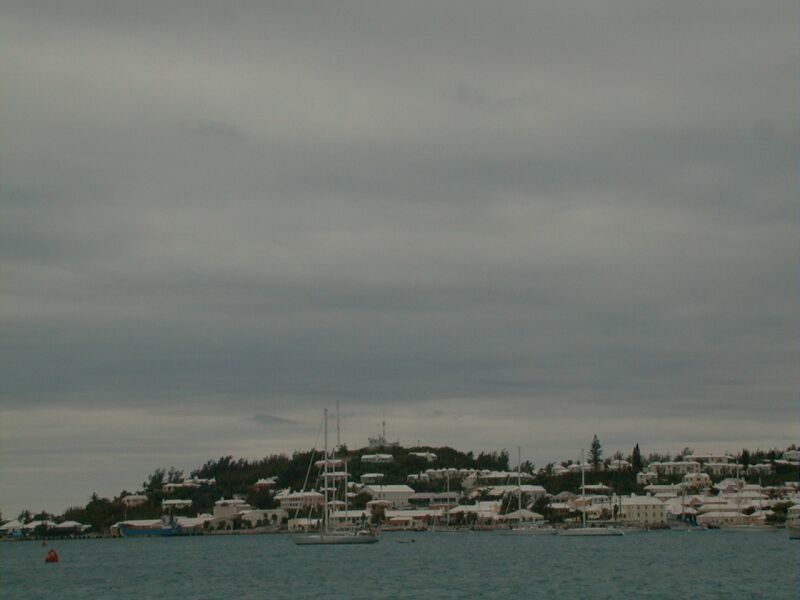 We heard Bermuda Harbour Radio giving them assistance in achieving a good tack to make it in. They actually did it successfully all the way to the harbour entrance. However, there are big cliffs on either side of the entrance which changed the wind direction. Just as they were about to run into the wall, the skipper tried cranking the fouled engine and it suddenly broke free - so they managed to save themselves. Whew! They had to wait to clear customs in the morning, so we didn't see them until the next day. Turns out, they also had a problem with their anchorage and ended up on some rocks briefly until the tide lifted them off. Shearwater had a rough night, and we were glad we had got here safely before the weather built up. Fortunately the winds weren't as bad in the harbour as it is shielded by the island. We heard some stories from sailors who came in after the storm that took some damage and/or got very wet in the very rough seas (about 18-20 feet) the night and day after we arrived. During the rest of the week, the girls spent time hanging out with Justin - a 13 year-old boy who was with his Grandparents on Shearwater - under the watchful eye of Frank and Karen :-). Karen and Frank spent some time with the adults on Shearwater and did laundry, shopping, and took the spinnaker over for repair. And, of course, there was homeschooling for the kids to be done. The current plan is to do some more touristy things around Bermuda on the weekend and then plan to depart early next week. We'll keep you posted on our progress.